Countdown Sales Timer offers two plans: a Basic plan (which is free) and a Premium plan (which costs money—not much though). If you have just installed Countdown Sales Timer on your store, you will be on the Basic plan by default. As you can see above, this allows you to publish one timer at a time, and choose from six themes. 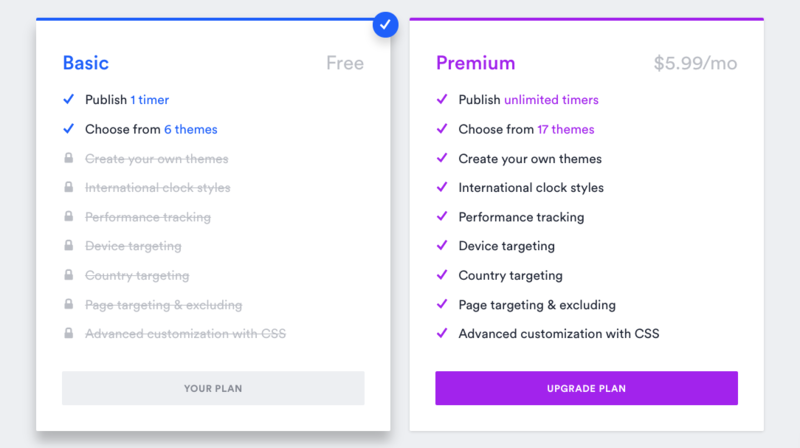 If you want to publish more timers, or if you want to target specific countries, pages, and devices, as well as unlock a whole slew of other awesome features, you can upgrade to the Premium plan. If, while on the Premium plan, you should want to downgrade or revert back to the Basic plan, all you need to do is click over to your Account page and hit the Downgrade plan button. You'll be prompted by a confirmation dialog box, which explains what will happen to your timers if you downgrade, and requests a little bit of feedback about why you decided to downgrade.